Drink of the Week newsletter: Like Shakespeare, except you get to drink. You are currently not subscribed to the Drink of the Week newsletter. You can change your subscription from your account page. As usual, we here at Drinknation have had it pretty rough this month. For the past two weeks, we've been forced to live a barbaric, sub-human existence in true medieval style, as the local water supply has been "disadvantaged" due to inclement weather. Apparently, heavy rains have churned up the metropolitan dihydrogen monoxide stock into a roiling frenzy of E. coli, hell-bent on the destruction of all that is good and honorable. Well, that's how the local news guy puts it anyway. Apparently the E. coli uses "dirt particles" to "hide in", thus avoiding the cleansing properties of all the chlorine and crap that cities add in there to kill it. At this rate, the E. coli will begin learning at a geometric rate and become self-aware at 2:14 am, next Tuesday. Somebody better get Rumsfeld on the case, it might be hiding some WMDs in that dirt too. So the end result is a boil-water advisory. We decided that was uncool, so instead we regressed a few hundred years to the feudal system approach: drink nothing but mead. Or possibly Manhattans. We're not picky, just as long as we get to order some serfs around while we're doing it. Those medieval types knew what they were about when they added alcohol-enabled substances to their water to ward off the disease du jour. So far it's working well for us, too. Only the test canary has suffered ill effects, but that was likely due to a bad cocktail onion in his Gibson. The serf responsible for serving it has been sacked. The only side effect of our foray into feudalism seems to be that we're having much more fun at work. The whole experience leads us to a question though. If putting chlorine and other nasty harm-inducing substances in the water can't kill off bacteria... why don't they use booze instead? 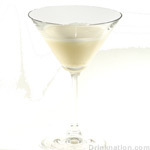 This drink recipe was submitted by one of our dastardly readers, Amandita! For previous Drinks of the Week in an easy-to-browse format, check out the Recipe Browser collection!